Some people prefer to plan activities for their free time very carefully. Others choose not to make any plans at all for their free time. 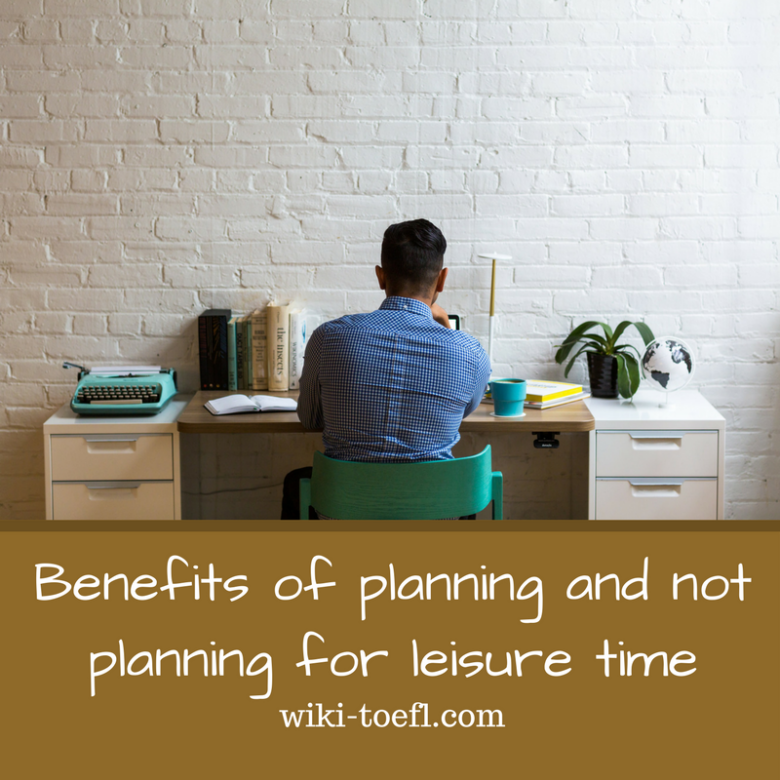 Compare the benefits of planning free-time activities with the benefits of not making plans. Which do you prefer­―planning or not planning for your leisure time? I think that free time is a precious thing for most of us. When we’re working hard, it’s nice to imagine what we’ll do when the weekend comes. We juggle one idea with another, trying to decide what best suits our budget and the amount of time we have. After all, anticipating free time is part of the pleasure. It’s good to plan what we’re going to do with our free time. That way we won’t waste any of it trying to decide. It’s so easy to just sit around and think about this or that activity. Before we know it, half the day is gone. If we decide ahead of time, We can get started in plenty of time, and we can get the most benefit out of the time we have. For instance, if we’re going on a picnic, we can get all our supplies ready to go. Or if we’re going to a movie, we can find out the time and how long it’ll take us to get there. Also, if we plan what we’re going to do with our free time, we can invite others to join us. If we wait until the last minute, our friends may have other plans. On the other hand, it’s also fun sometimes to do things without a plan. We can just leave the house and walk around and see what catches our attention. Often, this is how we discover places we never knew existed. We might end up doing something we never thought we’d try. We might just happen to find ourselves outside a new bookstore or a bowling alley and go in on a whim, because we have some free time. It’s nice if we can have the best of both worlds. We can plan our free time activities for one day of the weekend, and let the other day plan itself. This way our free time also gives us the enjoyment of having it both ways.